Do you go camping with your kids? Do they get bored after a couple of hours? Or do you find yourself looking for something to entertain them while it rains outside? I know, it never rains while camping (haha)! Do you like to go walking with them? 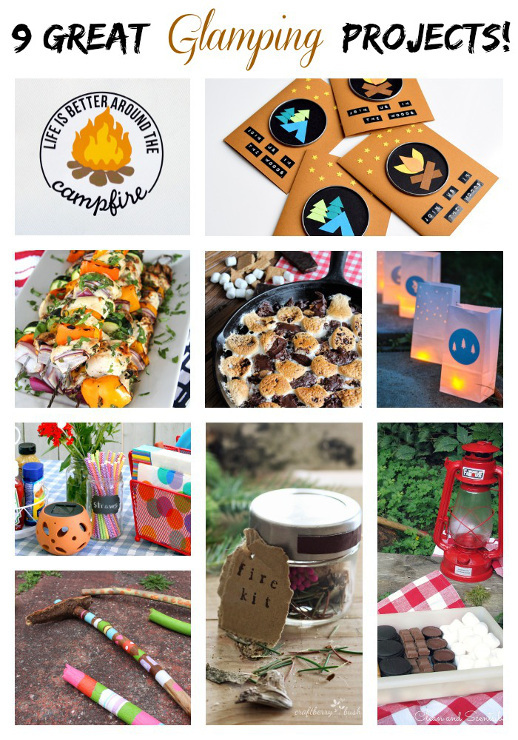 If any of these apply to you, you’ll love this camping craft.. perfect for Glamping! As soon as we get to our camping site, the first thing my daughters do is go out on the search to find their walking stick! They always end up finding a bunch of them. Two years ago we stayed in a Hobbit Home and during our walk we found the most unusual stick we had ever seen. It was a branch that had fallen off a tree, but kept part of the tree bark with it. Which made it the perfect walking stick with a handle. Plus the handle sorta looks like a boat. Ever since we found it, it travels with us when we go camping. This post contains some affiliate links for your convenience. Click here to read my full disclosure policy. 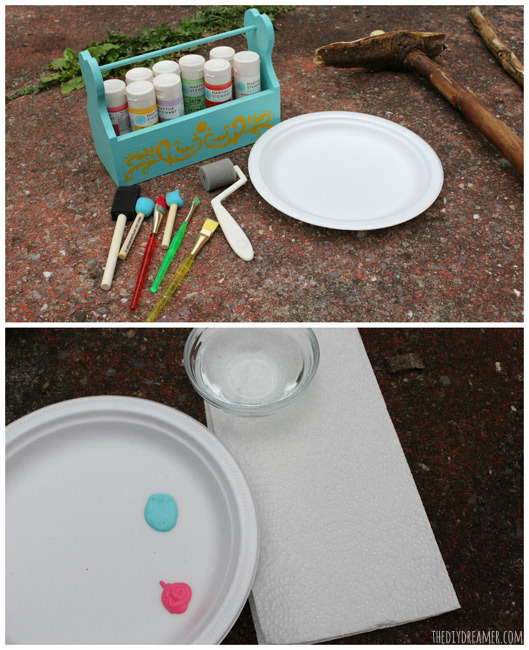 Step 2: Place the paint you want to use inside a paper plate. Take out the bowl of water and paper towel (you need these to clean your brushes between colors). Step 3: Paint the sticks as you please! Go wild and have fun! Mix colors, try different designs and patterns! A little reminder: Have fun! Step 4: Once you are done painting your beautiful walking sticks, apply a sealer over the paint. Step 5: Enjoy and go out for a long walk! Didn’t they turn out fabulous? 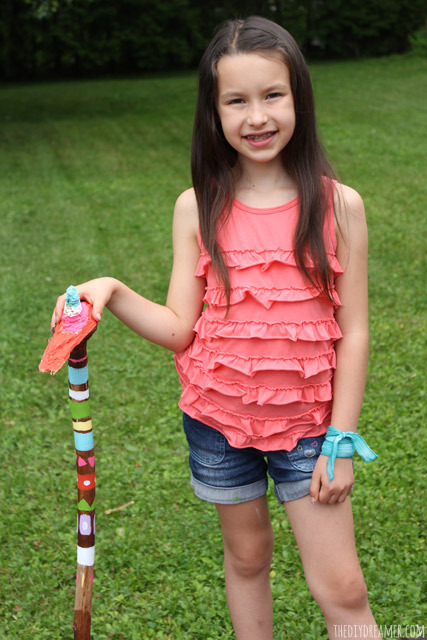 Gabrielle absolutely LOVED painting her walking stick. She actually painted two and Emanuelle was powerhouse and painted three! 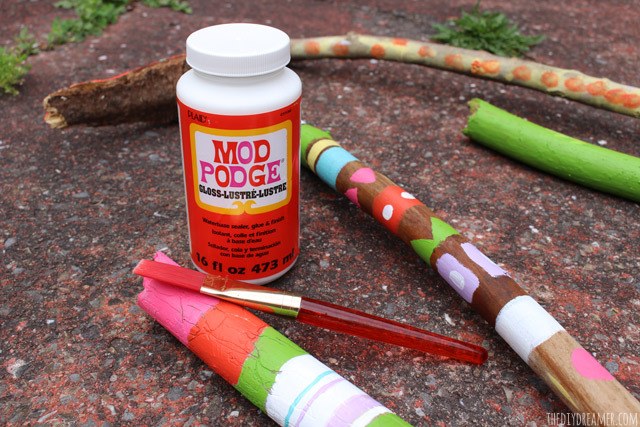 Fun and easy craft! What a great idea Christine! 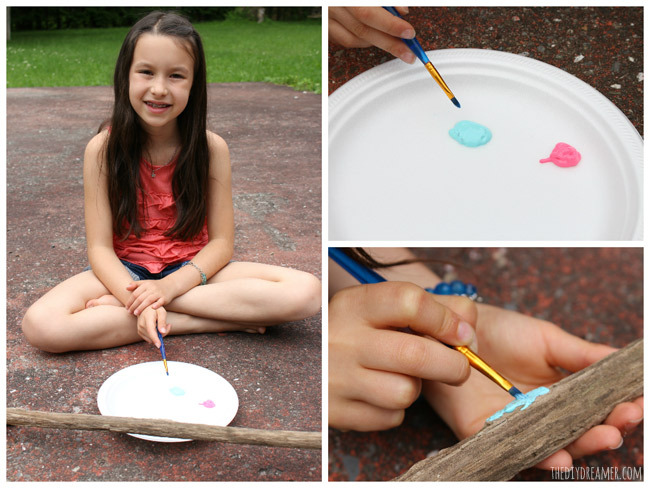 I love that the kids can paint them to their liking – this will encourage them to get out and hike! So fun! What a great project for the kids at the campsite. My girls would LOVE this, Christine! Pinned! 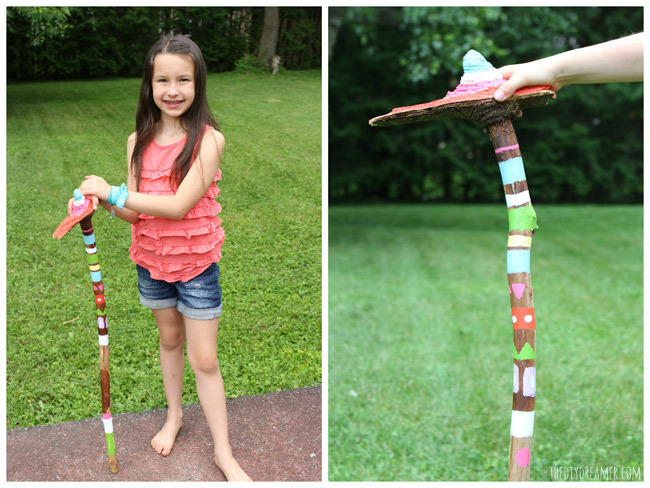 Those walking sticks are perfect, what an awesome project!! These are so fun and such a great way to keep the kids busy during the day! I love that stick with the handle – that hobbit home looks awesome! Totally neat! Love how they turned out and now I want one or three! If you haven’t already, we would love you to stop by our Snickerdoodle Sunday sometime! These are very cute. I am thinking about using these as a craft at summer camp. Thanks for sharing! I love these! Such fun and whimsical colors. I love this idea. It’s so simple but really pretty. I admit, I’m not really the hiking type but I would love just a bunch of these on display in a corner or in a bucket/basket on my patio. On the summer craft to-do list! My grandsons would love this craft. They’ll be coming down soon, so I’ll be making them with them. Thanks for the idea. I love going for walks, but it seems like we are always way-laid by a playground. Those are great too, but maybe if my kids had awesome walking sticks, they’d want to keep going! What fun! I’m sure they loved making them. We have 45acres of hiking land!!! 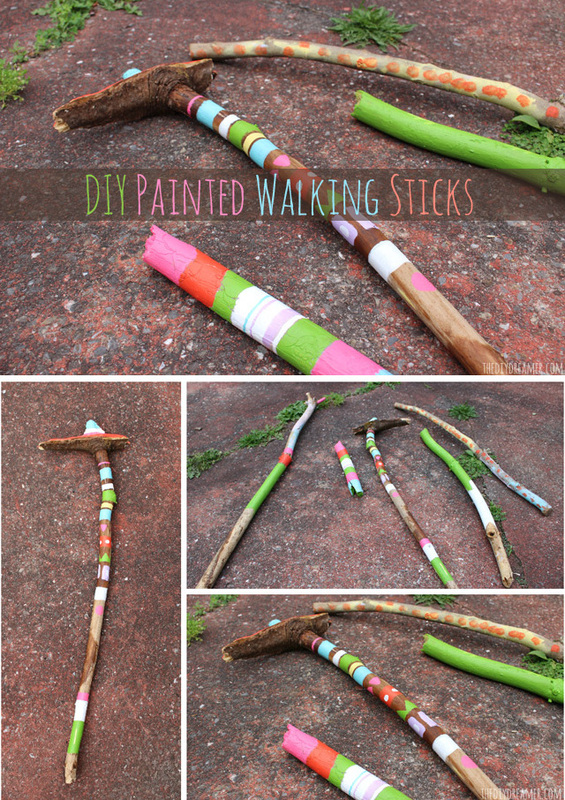 I must make these one day so the hubby stops throwing out my walking sticks! Awesome project Christine. My dad starting a tradition of carving designs into our walking sticks when we were little and I still have a couple of them. Good memories! OMG these are the coolest!!! 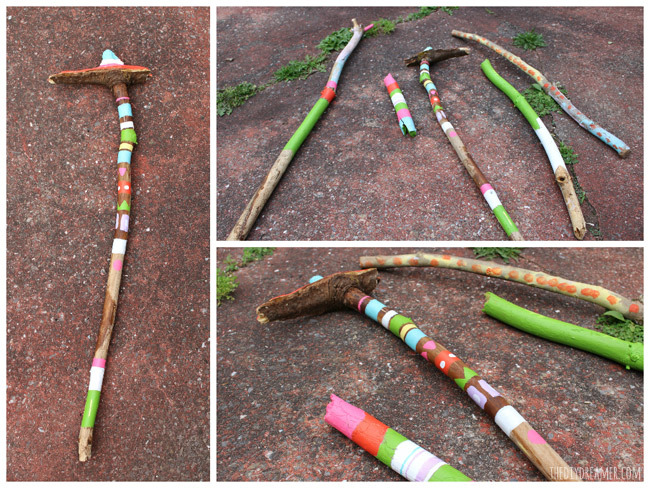 Love walking sticks, never thought to paint em! Love it. I looove this idea, it’s something my kiddies and I would totally try in the summer….yes! FUN!!! 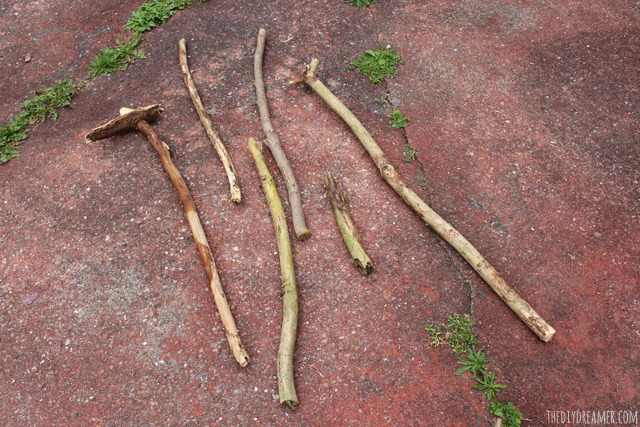 And great walking sticks – I love that the first thing the girls do is head off to find their walking sticks! I love how these turned out. Absolutely fabulous! 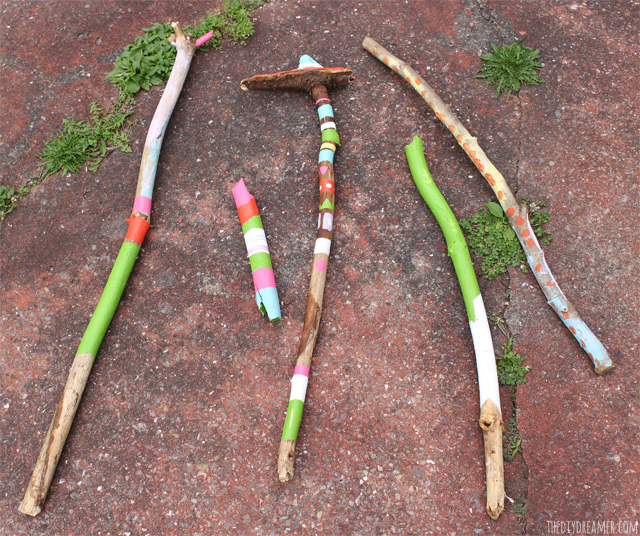 Your walking sticks look beautiful! I’d stick them in the garden or in a bucket by the front door when done with using them – to keep and remember the fun glamping trips!! 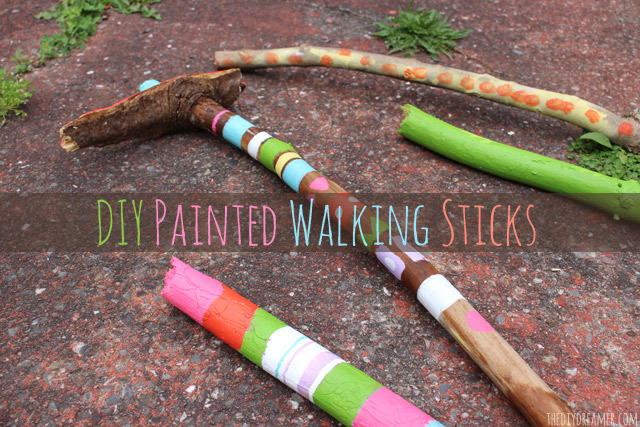 Oh, I love the idea of painting your walking sticks! Why have I not thought of it before? Camping must do from here on out! Found you at Artsy Fartsy Mama. If you’re interested in finding new link parties, I have one that is live right now at Gingerly Made and you are welcome to join. What a wonderful idea!!! They are so pretty and would look amazing in an umbrella stand on a porch too. How adorable! Love all of the fun colors and designs! Love all this! I am a reluctant tent camper with my husband and two kids, so the “glamping” makes things a little better :) Pinned! Those are awesome Christine, I really love them! I spent some time in Australia, and the remind me of all the aboriginal art I saw there. I’m sure your girls love them. Hi Christine…..I’m Christine too and I glamp also! I absolutely love this idea and my 2 girls will love it too…..I will definitely check out your other glamping crafts to do for my girls over the summer. Just curious….where do you camp if you are in Ontario? These are awesome!! My oldest would love making one- great idea!! We are going camping soon, I just might have to pack along some craft supplies after all:) Thank for sharing this idea Christine- pinning it! Never mind the kids, I want to do this. Thanks for sharing. Hello from Flaunt it Friday! Congrats! I picked these awesome painted sticks as a feature at our Link it or Lump it party. We were just talking about walking sticks as we prep for some summer hikes – what a beautiful project — you guys did a great job! I’m a big one more glamping as I like to have indoor bathrooms and no snakes where I sleep :) I’m linking back to you from our summer activity round-up this week.